As the temperatures drop and the snow falls, we are all reminded how important home is--that is, a place that is safe from the elements, from fear of eviction because of rising rents, from fear of arrest because of immigration status. This January, NJ-08 for Progress asks you to take action on housing, to ensure everyone has such a home. Jersey City Together has spent years at the forefront of the fight for better living conditions for the people of Jersey City and Northern New Jersey. This month, we ask our members to join us at the Housing Working Group meeting of JC Together on Jan 22 at 6:30 pm at 324 Communipaw Avenue in Jersey City. Feel free to bring a friend! JC Together is looking particularly for victims of housing discrimination or fraud, but they welcome everyone who is interested in the problems of affordable housing and homelessness. Many of the homes in our communities and in our district are filled with immigrants, and the children of immigrants. It is time for Albio Sires, himself an immigrant, to take more than a symbolic stand for the Dreamers who are losing their DACA status. 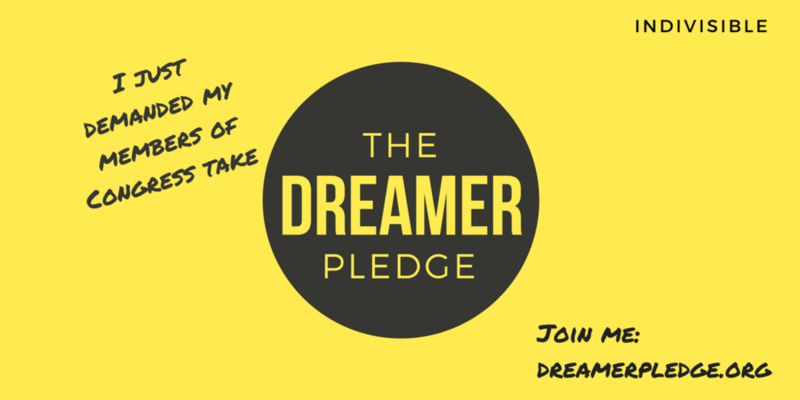 Tell Sires to sign Indivisible's Dreamer Pledge, promising to support no continuing resolution without a clean DREAM Act. While you're at it, you can remind Cory Booker and Bob Menendez of the importance of immigrants to the state of New Jersey as well. You can find the Dreamer script here--and be sure to tell the Indivisible folks how it went!